Candidates above 18 applying to the Junior Personnel Officer post must not exceed the upper age of 44 Years as reckoned on 01-07-2018. The Upper Age-Limit is relaxed up to 5 years for SC/ST candidates and 10 Years for Physically Handicapped Candidates. Candidates interested to join as Junior Personnel Officer must have secured First Class B.A/B.SC/B.Com Degree from a recognized University/Institution. Candidates contending for the post of JPO are liable to pay Initial Processing fee of Rs 100/- payable via online mode. Candidates belonging to SC/ST/PH category are exempted from paying any Examination fee. Written Exam will consist of 100 Objective Type Questions divided into 2 sections. Section-I consist of 60 questions on Human Resource Management, Industrial Laws, General Laws & Labour Laws etc and Section-II covers questions based on English Language, Computer abilities,General Awareness, Logical Reasoning and Numerical ability and History related to Telangana Culture & Movement. Time Allotted for the written Exam is 2 hours. Refer the Annexure-II for brief syllabus. 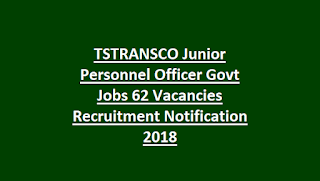 Candidates selected will be appointed on a probationary period of 2 years, first year of which is meant for training under the jurisdiction of TSTRANSCO. Selected candidates at the time of joining shall have to execute a bond to serve TSTRANSCO for a minimum period of 5 years + one year training period. Candidates interested can apply online through the official website http://tstransco.cgg.gov.in/ before the due date i.e. 11th September 2019. 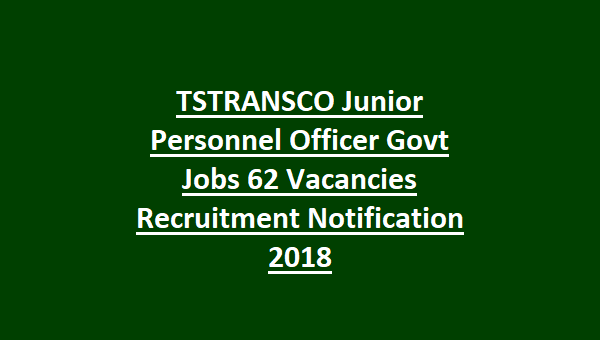 Candidates seeking possession under TSTRANSCO Junior Personnel Officer Jobs Recruitment 2018 can refer the official notification.